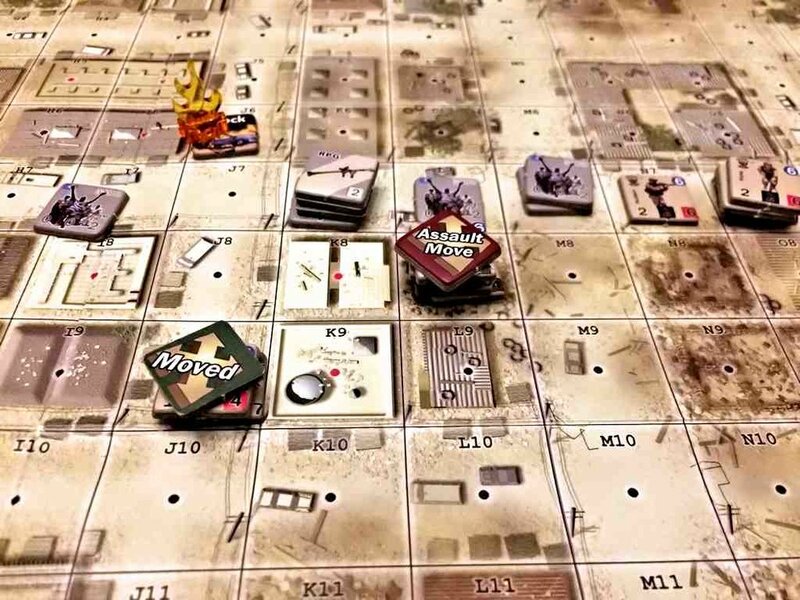 Recently I sat down to play through the second scenario in Day of Heroes, from Lock ‘N Load Publishing, titled Chalk 2’s Run. My initial impressions were that the Somali militia is simply no match for the well-trained, and much better equipped Army Rangers, and that it would be a cake walk. In the end, the firefights were decidedly one-sided in favor of the Rangers as expected, bearing this out. However, the mechanics of spawning mobs to clog up the streets, and at times bring in more militia, poses some different tactical problems to keep play interesting. Dispersing the mobs is easy, but the US player has to be mindful of how costly running too many away can be in the end scenario scoring. Force too many to disperse, and you can lose the scenario. 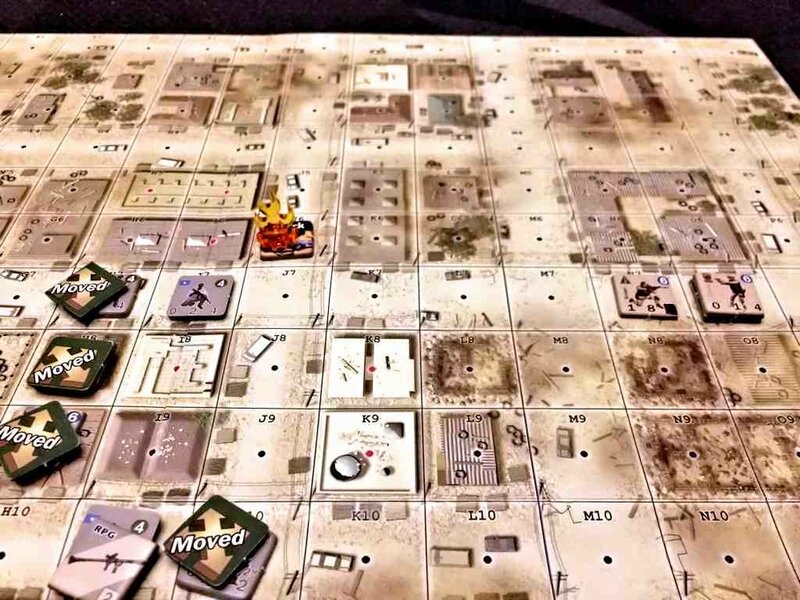 It’s an interesting way to model the difficulties in dealing with the civilian component of an operation, and adds quite a bit to the claustrophobic nature of an already tight city map. This creates a very enjoyable game, and a fun narrative. So I decided to jot down a quick AAR and share it. October 3rd 1993 – Lt. Smith can still see the explosion clearly, the afterimage etched indelibly into his mind’s eye. First, was the smoke trail jetting into the sky, then a deafening bang, as the rocket-propelled grenade slammed into the tail rotor housing of the Blackhawk which had been cruising above the rooftops. He and his men watched helplessly as Super 61 auto-rotated in, hidden from view by the buildings to their northeast. Seconds later, another terrible explosion and a column of black smoke confirmed that the UH-60 had indeed crashed. After a quick head-shed with his company commander, Smith was authorized to take a portion of his chalk to the crash site and secure it, then await extraction. To this point of their journey, they’ve been lucky in avoiding contact, but that was about to change. Lt Smith signaled Hudson, who was in a building to his northwest, to move his team south, down the western street. As the team broke cover to begin their movement, a Somali militia squad appeared out of nowhere and launched an RPG. The short range and limiting space of the narrow ghetto streets aided in driving an incredibly lucky shot true. The warhead hits an abandoned vehicle, erupting into an intense fireball, spewing deadly fragments across the dirt clogged streets. The shrapnel from the old junker does its job, tearing into Hudson, and knocking him to the ground wounded. The medic immediately drops prone and worms his way behind cover, arriving next to his squad leader and quickly begins working on him. Hudson, still conscious, orders his squad to keep advancing to the next corner and setup cover so the Lieutenant can move. The young Lieutenant saw Hudson go down, and that the doc was busy doing his job. Knowing that the best move was to draw fire away from his wounded soldier, he moves his team into the south building, while Hicks provided overwatch for his wounded friend. Hudson’s squad had already set up at the southern crossroads, taking cover behind the motley assortment of beat up and patched together vehicles that pass for cars here in Mogadishu. The sounds of an angry mob advancing from the east signaled to the Rangers that their planned pathway to the crash site is likely being cut off. Knowing the restrictive ROE of the US troops, a gaggle of Somali militia blends in with the mob, using the human shields as cover. At the same time, the militia men rile the mob into a bloodthirsty frenzy, ready to physically take on the heavily armed Rangers if they can get close enough. Local militia leader Will Waal deploys several groups of armed men south, in order to intercept the Rangers. The growing throng of armed Somali’s gets further inflated when another mob joins their ranks. From his vantage point, Hicks spies some small arms in the mob, and radios a spot report to his platoon leader. He also notices the mob that was directly to his north has lost interest and wandered back to wherever they came from. This opens a hole for him to head to the crash site, which Smith orders him to do, but carefully. Smith has his gunner lay down a burst of M-60 fire over the heads of the first mob, careful not to inflict civilian casualties, which disperses them immediately. The armed militia embedded within disappears from sight, but the Lieutenant recognizes the familiar sight of AK-47 barrels poking from behind cover. Telling him that some troops still stood in their way. The Rangers make short work of the remaining Somali forces that have stayed behind. As the echoes of the shots fade down the streets, a wild RPG shot crashes harmlessly into the building to his right, emanating from a corner building to their left front. Hudson, now patched up, is back in the fight. He sends the medic south to link up with the other squads, before joining Hicks for the move to the crash site. Hicks hand signal’s him to freeze and stay put, a small force of Somali’s had moved onto the street in front of Hicks’ building. As another group comes around the bend to join the first, shots ring out from Super 61’s pos. The SEAL sniper’s precision work eliminates the Somali squad before they know what hits them. “Alpha Mike Foxtrot”, mutters Hicks, as he sees some of the militia drop, while the others break and run. Hudson doesn’t have much time to admire the sniper’s handiwork, as another RPG rips into the ramshackle hovel that he’s in at nearly the same time. The din of the explosion is deafening, but Hudson emerges unscathed. In the middle of the city, and despite his Khat induced haze, Waal recognizes the situation is becoming more desperate. He rallies what’s left of the militia and begins the trek to the location of the downed helo, with hopes of drumming up more mobs on the way. Any additional mobs that the US are forced to deal with, the better. Clogging the streets with unruly masses will not only slow the Americans advance, but they just may luck out and inflict some casualties, or take some. Either way, he sees that as a win. The militia redirects to the crash site, hoping to beat the Rangers there. Back to the north, the SEAL sniper eliminates the last Somali squad standing in the way of Hudson and Hicks, giving them a clear path to the helo and their much needed additional fire support. Meanwhile to the south, Smith’s squad assaults the building where the RPG fire originated from, and eliminates them to clear the building. The Lieutenant double-times his team in pursuit of Waal’s men, pulling up just short of the corner, remaining behind cover. Rangers defeat the militia in CQB melee. More angry citizens spill into the streets, a growing network of mobs trails in the wake of Hudson and Hicks as they reach the crash site. RPGs and small arms can again be seen among the masses, they’ll leave these to the sniper, as he’s been highly effective in slotting them cleanly so far. They radio their situation to Smith, who’s also closing on Super 61’s pos from the south. He acknowledges the transmission as his team unleashes havoc with small arms, augmented by the squad M-60 and 40mm grenades, and takes down the two Somali squads standing in their way. Somali militia and the Rangers race to the objective. Seeing the jewel slipping from his fingers, Waal and his men make a desperate and futile assault against the downed helicopter with small arms and RPG fire. The warheads detonate amidst the wreckage, but the armor protects the men covered within. In return, Waal’s men are peppered with fire from both Hicks and the sniper, quickly putting the untrained troops out of the fight. Waal slinks away in the confusion of the firefight, with lessons learned for next time. As the rest of the Ranger force closes on the crash site, Smith orders more shots fired overhead to disperse the two mobs in their path. These are back-filled almost immediately as more people spill into the streets, increasing the chaos among the growing throngs. Hudson reports more small arms and RPGs spotted within the groups. Smith, feeling the situation is precariously close to falling apart, orders his troops to shoo away the two closest mobs, and then to move forward and set a perimeter before going weapons tight. They can’t afford the situation degrading any further. Smith moves his two squads to envelop the armed troops, and take them out once the mobs are cleared. The Rangers assault move, ready to engage the militia once the mob disperses. The Lieutenant’s squad drops into some rubble by the side of the road, adjacent to the mob, while the other squad is sent around the block. The militia sees the Rangers moving into the rubble on their flank, and quickly engages with their rifles, followed by an RPG. 7.62 rounds splash wildly into the detritus, splintering wood and rock, but leaving the Rangers unharmed. The rocket propelled grenade explodes in the middle of the debris field, leaving more in its wake, but also fails to inflict casualties on the US troops hunkered down in the heavy cover. The mobs continue to inch towards the foreign invaders, emboldened by the militia strewn among them. Just as the situation seems untenable, deliberate shots ring out from east, and in the ensuing chaos, the mob loses its nerve and scrambles away. The work of the SEAL sniper is evident in the bodies of militia troops lying motionless on the ground. Before the other militia team can reengage with their RPG, Smith’s troops cut the remaining team down in seconds. The sniper eliminates the final threat to the mission. Radio traffic from all team’s report that the mobs have melted back a few blocks, and don’t appear willing to press the issue further. The fight in them appears to have abated, for now. The sound of approaching vehicles tells Smith it is time to go, gathering up his troops, the Lieutenant hustles his men to Super 61’s crash site to await the convoy for exfil.